This volume explores the intersection of robust intelligence (RI) and trust in autonomous systems across multiple contexts among autonomous hybrid systems, where hybrids are arbitrary combinations of humans, machines and robots. To better understand the relationships between artificial intelligence (AI) and RI in a way that promotes trust between autonomous systems and human users, this book explores the underlying theory, mathematics, computational models, and field applications. It uniquely unifies the fields of RI and trust and frames it in a broader context, namely the effective integration of human-autonomous systems. A description of the current state of the art in RI and trust introduces the research work in this area. With this foundation, the chapters further elaborate on key research areas and gaps that are at the heart of effective human-systems integration, including workload management, human computer interfaces, team integration and performance, advanced analytics, behavior modeling, training, and, lastly, test and evaluation. 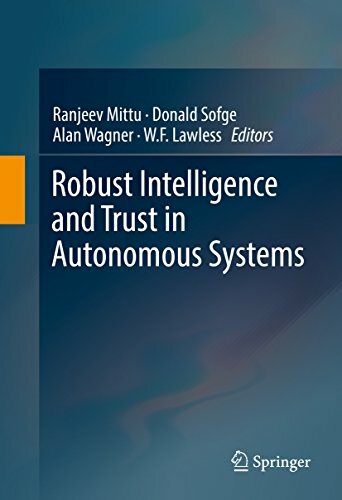 Written by international leading researchers from across the field of autonomous systems research, Robust Intelligence and Trust in Autonomous Systems dedicates itself to thoroughly examining the challenges and trends of systems that exhibit RI, the fundamental implications of RI in developing trusted relationships with present and future autonomous systems, and the effective human systems integration that must result for trust to be sustained.